Attendees will gain an understanding on how MPI helps retailers protect their price position, identify where they carry a price premium, and more. On February 24th, 2016, retail insights leader Wiser will host a webinar to help retailers understand the importance of Market Price Index (MPI) and how they can use it to their advantage. 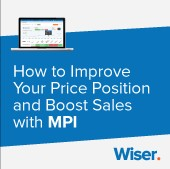 The webinar, titled "How to Improve Your Price Position and Boost Sales with MPI” will be led by Wiser’s Head of Pricing and Analytics, Luke Lin, on Wednesday, February 24th at 10 AM PST. Retailers will also get insight into how MPI can be used to decipher Amazon's own pricing strategy. The retail giant has garnered a reputation for its competitive prices, and Wiser has assembled exclusive pricing analysis to shed light on Amazon’s MPI and what conclusions we can draw from it. Wiser’s webinar will also cover how retailers can use Market Price Index to help refine their own pricing strategies, boost sales, and get ahead of the competition. Pricing is incredibly important, but forming a strategy without the right kind of competitive intelligence can feel like an impossible task. Attendees will gain an understanding on how MPI helps retailers protect their price position, identify where they carry a price premium, and more. Wiser empowers brands and retailers to compete in the ever-changing retail industry. We level the retail playing field by equipping brands and retailers with a turnkey solution to sell the right products, at the right price, at the right time. Wiser's suite of data-driven merchandising solutions include: dynamic pricing, assortment and pricing optimization, MAP monitoring, and more. For more information on Wiser, please visit wiser.com. Wiser / Wise Commerce Inc.